The stairway of Ahaz is mentioned twice in the old testament. Once in 2 Kings 20:9-11, and again in Isaiah 38:8. Ahaz was the king of Judah from 735 to 715 BC. But he wasn’t a very good king. He basically aligned himself with the nation of Assyria, and he adopted the worship of foreign idols, and he even lost control of some of Judah’s territories. And he evidently made some changes to the temple in Jerusalem, possibly even introducing some idols into the temple itself. And there was a stairway going up into a part of the temple, that had come to be referred to as the stairway of Ahaz. Exactly why, we’re not told. But let’s read one of the scripture verses that mention the stairway of Ahaz. Picture, if you would, a long stairway. Probably at least twenty stairs, or maybe even thirty stairs long. A stairway that extended quite a ways up. Now if this stairway faced to the west, or even partially to the west, then as the sun would cross the sky in the afternoon, it would shine on this stairway. And as the sun got lower and lower in the sky, the upper stairs wouldn’t catch the light of the sun anymore. They’d begin to be in the shadow. And as the sun got even lower, and it’s rays got lower, the shadow would come down the stairs, until eventually, the shadow would cover even the bottom step. And then the sun would go down out of sight. That’s not natural is it? The shadow doesn’t go down the steps, and then all of a sudden, go back up the steps. God would have to either make the earth go backwards in it’s orbit around the sun, or He’d have to somehow, “bend” the rays of the sun, to shine back down on that stairway, or maybe, He’d simply say, “Let there be light”, and the light would shine on the stairway again. But no matter how God did it, it was a miracle! Let’s read the scriptures, and see WHY God did this. Now that’s quite a statement to hear from a prophet of God. “You shall die and not live”. Hezekiah was the son of Ahaz. And he was king of Judah, after his father, and he reigned from 715 to 686 BC. But Hezekiah was NOT an old man, when he was told that he was about to die. It says in 2 Kings 18:2, “He was twenty five years old when he became king, and he reigned twenty-nine years in Jerusalem.” We’re going to see, as we read further, that after Hezekiah was told that he would die, he prayed earnestly to God, to spare his life. And God heard his prayer, and allowed him to live another fifteen years. So then, Hezekiah became king at the age of 25, and he had already reigned for fourteen years when he became sick. That means that he was only 39 years old when Isaiah told him that he would die. But listen to what’s said about Hezekiah, in 2 Kings chapter 18:3.. “And he did what was right in the sight of the Lord, according to all that his father David had done.” David of course was a “forefather”. Nehushtan means.. “the bronze god”. Moses made that bronze serpent sometime around 1450 BC. And Israel had been burning incense to it, since some time after Moses had died. Probably after Joshua also had died. I can’t imagine either Moses or Joshua ALLOWING the Israelites to burn incense to a bronze god! But isn’t that typical? Worshipping the creature, rather than the creator! Romans 1:25. But yet, at the age of 39, he became mortally ill. He most likely had a tumor. Some bibles call it a “boil”, but the word used, really means a tumor. Do you think they asked the same question in 700 BC, that we ask now? Why do bad things, happen to good people? Maybe it’s simply genetics. We don’t know WHY. But we DO know, that we can always call on God, and TRUST that He will do what’s right for us. Now, back to 2 Kings chapter 20. Hezekiah had just been told by the prophet Isaiah, “for you shall die and not live”. That’s the providence of God! Can we say that, when we go to God in prayer? By all means, if we need forgiveness, we should certainly pray for forgiveness, or we’ll never BE forgiven! That’s the kind of prayer that we should all be able to say to God, every day! Lord, please remember what I HAVE done. Not what I WILL do. Not what I should have done. And not what I’m sorry for doing. But what I HAVE done for you. How I HAVE obeyed your word. That’s about the quickest answer to a prayer that I’ve ever heard of! Isaiah tells Hezekiah, that he’s going to die, and then he evidently leaves Hezekiah’s presence. Hezekiah, turns toward the wall, and in tears, pleads with His God, to remember him, and to heal him. 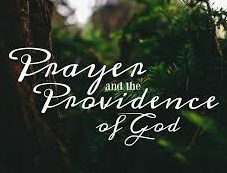 And before Isaiah has even gotten out of the middle court of the temple, God has heard the prayer of Hezekiah, and has decided to give Hezekiah, what he prays for. Anyone who thinks that leading a life of obedience to God, doesn’t result in great blessings, hasn’t read the bible. Listen to what the bible says about Jesus, our High Priest..
Hebrews 5:7 says, “In the days of His flesh, He offered up both prayers and supplications, with loud crying and tears, (sounds like Hezekiah, doesn’t it?) to the One able to save Him from death, and He was heard because of his piety.” That really sounds just like Hezekiah! Does a life of obedience to God result in great blessings? Yes it does! Hezekiah had already done good. He had already walked before the lord in truth, and done God’s will. And so when he prayed for his life, God knew that Hezekiah would continue to live like that, as the king of Judah. Hezekiah’s life was a blessing to those he ruled over. Do you remember king Solomon’s prayer in 1 Kings chapter 3, how he prayed for wisdom, to be able to judge the people of Israel? Listen to 1 Kings 3:5-8..
What has characterized Solomon’s prayer so far? One thing, that surely characterized his prayer.. Is praise to God! Praise for God’s greatness, and praise for what God has done. We can learn a lot from a prayer like this, but we haven’t even read yet, what it was that Solomon asked for. King Solomon understood the greatness of God. And he understood the greatness of what God had done. And he understood the importance of what needed to BE done. 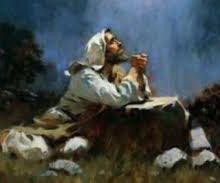 And so Solomon prayed to God, and asked God, for the blessings needed, to be able to DO God’s will. As I said, we can learn a lot from a prayer like this. And we NEED to learn from it. Hezekiah was heard for his piety; And so can WE be heard. Let’s go back to 2 Kings 20, and I’ll read verses 8-11.. The sun had gone down, and the shadow had gone down, on the stairway of Ahaz. But God said; “Let there be light”, and the shadow went back UP the stairway, ten steps. God’s light shinned once again, on that stairway. And Hezekiah prayed a prayer of humility and of sorrow, to the God of mercy, and God’s light shinned on Hezekiah for another fifteen years. The first thing we need to do, is to “walk before God in truth”. We’re told in John 17:17, “Thy word is truth”. And so if we want God to hear us, we have to hear His word..
Rom 10:17 says, “So then faith cometh by hearing, and hearing by the word of God”. You’ve got to HEAR God’s word. Do you hear His word this morning? Do you hear what it’s saying? THEN, after we do those things, THEN we can see what else God will do for us. I know one thing that He’ll do..
Rev 2:10 says. “Be faithful unto death, and I will give you the crown of life.” That’s a promise, from Jesus to you. May God bless you in the study of His word, and crown your life. I look forward to your comments and questions. Please use the space below for your reply. I am thankful for your article. 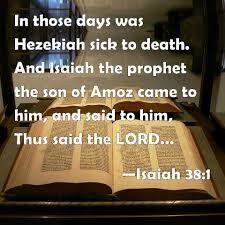 I have been lost in thought of the magnitude of the event as I read Isaiah 38 about King Hezekiah’s illness! And the Sign of the Sun going down and back 10 steps on the Stairway of Ahaz. After reading your study I am aware of a few things that I had definitely missed reading these verses before and want to say your ‘dividing of the scriptures’ was an encouragement and pleasure to read. Well thank you Robert for visiting the site, and for reading this article. I can tell that you must have a love for God’s word. Are you a church member Robert? I always love to study with people who also love the word. Would you like to take part in a study? There are so many subjects that are so interesting, and that we all can learn more about. Please let me know if we can study the word together. God bless. I can fully understand Jeffery’s question. It is difficult looking for both the needle and the thread that goes through the eye of the needle even without the haystack. But I also that “books” on the bible are mostly “commentary” and as such are just another persons OPINION. That OPINION can put you in a different haystack. You will be trying to put the wrong thread into the eye of the needle or vice versa. I don’t trust organized religion. Why are there over 30 thousand denominations and ONE bible for their source? BTW. Thank you for the history lesson about King Hezekiah and Isiah. It helped me with the approximate date of the reversal of the earth rotation. Hello Charles. Jeffrey was just wondering if there is a book that doesn’t just give a man’s opinion, but one that simply explains what the bible has said. Sometimes a good explanation in layman’s terms can be helpful. I’m not sure what you’re alluding to with your needle and haystack analogy. I agree with you about commentaries however. Many of them are simply another persons opinions. As to why there are 30 thousand denominations.. I guess that just goes to show that man can find 30 thousand ways to twist the scriptures to fit their own desires. I can guarantee you, that the bible has only one correct meaning. Most people simply aren;t interested enough in the correct meaning to study and find it. Yes, the bible requires lots of study. That’s jsut the way it is. Obviously, that’s the way God intended it to be. He wants us to really want to knwo the truth. Thanks for your comments. What are you referrign to with the needle and haystack analogy? Very impressive article on the stairway of Ahaz, very beautiful photographs as well to go well with the article. I do my best to read and understand the God’s word, but I must admit some parts are difficult for me to be sure I am understanding it the way God intended. Could you recommend any books I could purchase to learn Gods word easier than just reading the bible, I am always looking for good Christian based books to read. Hello Jeffrey. I remember that you’ve visited here before. Thanks for coming back and for your comments. We can all have trouble at times understanding some parts of the bible. That’s why it’s so important to have good study habits, so we can keep learning. We’ll never know it all! Muscle and Shovel is written by Michael Shank. You can simply google “Muscle and Shovel” for info on how to order. If you can’t find a copy, I would be glad to send you one, my compliments. Let me know. Thanks again for your comments. May God bless. Hi again Jeffrey. I should have asked in my last reply to you. Is there anything that you would like to study, to be able to have a better understanding of the bible? I would be glad to help you with a study if you would like. Please let me know. Thanks again.